Charge, store, secure and transport up to 30 devices. 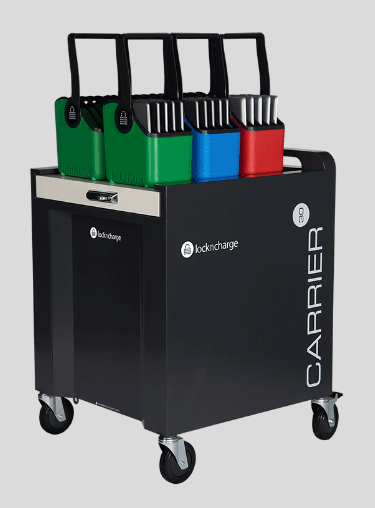 The Carrier 30 Cart is designed to make life easier for Chromebook, Tablet, Laptop and iPad Deployments. Style meets functionality. For better workflow, the Carrier 30 features a top sliding lid so devices can be accessed faster, easier and by more users at once. Lifetime warranty. No matter the environment, LocknCharge Carts are built to last. Efficient charging. With ECO Safe Charge, the Carrier 30 Cart charges devices safely and efficiently by staging the availability of power to each bank of devices. Additionally, a remote control is included so that the Cart can be turned on from almost anywhere. Compatible. Baskets by LocknCharge are designed to accommodate almost any device, including larger Chromebooks as well as most Tablets with cases. Are your devices too big for the Baskets? 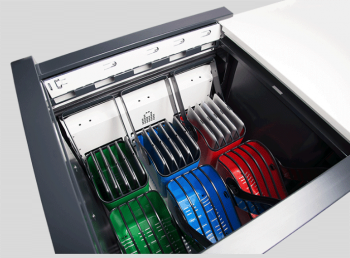 The Carrier 30 Cart features a three level adjusting storage shelf. This allows users to insert the optional device wire storage racks into Cart’s storage area (which replaces the Baskets by LocknCharge). The storage racks are designed to accommodate larger devices like laptops. Easy cable management. LocknCharge cable management has been simplified so that you can wire an entire Cart in minutes. Save time with set up and gain time using your Cart. Highly Secure. Our heavy-duty construction and a two-point locking system protects your valuable device investment when they’re not in use. Additionally, an optional anchor kit can be used so that the Cart can be secured in one location. Modular syncing (optional). Don’t buy a new Cart, purchase the hand held iQ 16 Sync Charge Box™ which allows you to carry the unit to where syncing is required (sold separately). Contact us for more details. Secure soft closing, sliding lid. Doubling as an additional work space, the soft closing lid can hold up to 40 lbs of additional resources when extended. External charging display. Easily know the charging status of your devices without opening the cart with the external charging display. Carry Basket Internal Dimensions. Not sure whether your device fits? Click here to download the Large Basket device compatibility document – for NEW Carrier 30 Charge Only Carts (June 2015 and beyond)! Follow the instructions to determine whether your device fits. SKU: L831214 – Carrier 30 Sync and Charge Cart – sync’s iPads and Samsung Galaxy tablets. Please note: Maximum load of 40 lbs per soft closing, sliding hood when extended.